Mali uromastyx can live long and healthy lives with proper care and a good home. Unfortunately, even with the best of care injury and illness can occur. When you suspect your pet may be ill, a visit to a veterinarian is always recommended. Below is a list of the more common illnesses that can effect your pet. A deficiency of calcium or vitamin D3 can lead to metabolic bone disease. Symptoms include lethargy, partial paralysis, constipation, seizures, and deformities. Supplying your uromastyx with proper lighting and supplements is the best way to prevent deficiencies. A digestive tract obstruction is also known as an impaction. It is caused by a reptile eating something it can’t digest. It can been sand, gravel, substrate, or food that is too large. These items can form a blockage that can be fatal. The best way to prevent impaction is to avoid sand as substrate and to make sure food is quite small making it easy to pass through the digestive tract. Symptoms can be constipation, lethargy, trouble breathing, and paralysis. Cuts, scrapes and other injuries may occur from an accidental fall, fighting, or from a sharp object. The injury should be treated with a disinfectant ointment and a visit to a veterinarian is recommended. Mouth rot is an infection that cause salivation, a reddening of the mouth, pus, mouth ulcers, and swelling. The infection can eventually spread and lead to death. 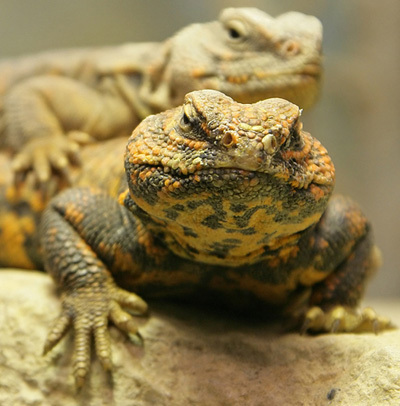 Mouth rot is most often caused by a uromastyx being kept in an area that is not warm enough. Uromastyx sometimes get a buildup of white crusty mucus around the nostrils. It is caused by them excreting excess salt. The crusty mucus usually falls off on its own and is not a cause for concern. Signs of respiratory infection are gasping, noisy breathing, rapid breathing, and mucus discharge from the nose and mouth. These infections are often caused by too much humidity or too little heat. Uromastyx can get skin conditions around the mouth and other parts of the body. The mouth can appear inflamed or a patch of skin can be yellowish in color. Too much humidity is often the cause of the skin ailments. A uromastyx will sometimes climb the glass of a tank. This will sometimes lead to him bending to far and hurting his spinal cord. Making sure there is plenty of hide areas and places to climb will reduce this behavior.